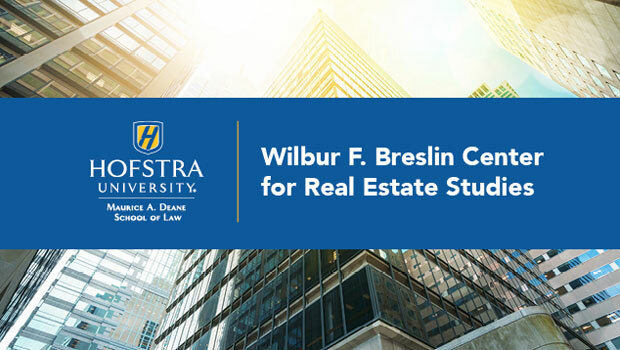 The Wilbur F. Breslin Center for Real Estate Studies will become part of the Maurice A. Deane School of Law at Hofstra University to respond to the need for more attorneys with the skills and training to navigate the challenging and changing real estate market. The move will allow the Breslin Center to expand its programs for Hofstra’s students and members of the real estate industry, focusing on land use, zoning and finances, which are key to addressing such major issues on Long Island as the revitalization of many downtown areas, and senior housing. Hofstra Law Professor Ashira Ostrow has been named executive director of the center. She is also the Peter S. Kalikow Distinguished Professor of Real Estate. Named for one of Long Island’s leading real estate developers, the Breslin Center was established by Hofstra University in 2007. It provides real estate professionals, municipal officials, developers and the public with information, education and scholarly analysis about the complex issues facing the real estate field. In collaboration with the Long Island Real Estate Group, the Breslin Center is planning two new programs: a Pathways to Real Estate Practice panel for Hofstra Law students and an Introduction to Real Estate Practice course. The course will focus on the interrelationship between municipal real estate law and the Long Island development community and will help students understand the balance between the positive economic impacts of real estate development and the desire to preserve neighborhood quality of life. Five events are planned for the year at the Breslin Center. They include an annual conference with the Zarb School of Business on real estate investment opportunities, and an annual Land Use Training Program for municipal planning and zoning officials. “Our goal is to develop new courses that combine classroom and practical, real-world experience,” said Professor Ostrow. The courses will focus on land use, finances, working with municipalities and quasi-governmental agencies, and other issues. The Maurice A. Deane School of Law will celebrate the relaunch of the Breslin Center from 4-6 p.m. on January 24 with a program featuring a conversation between Mr. Breslin and Judge Prudenti. It will be followed by a Q&A session with law students, alumni and members of the real estate community, and a cocktail reception.